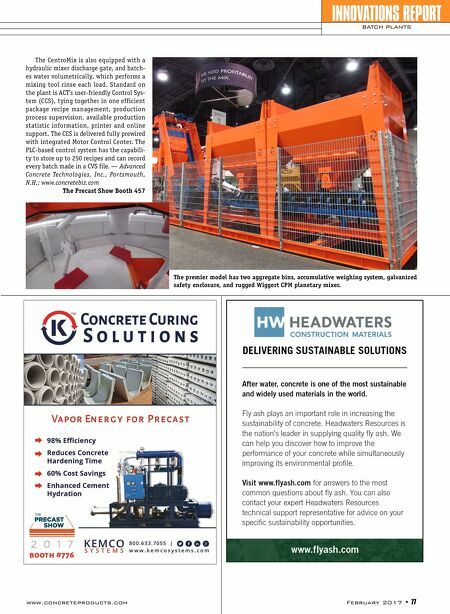 76 • February 2017 www.concreteproducts.com Advanced Concrete Technologies, Inc. enters 2017 with a new line of affordable batch plants equal to a wide range of applications. The small footprint CentroMix models arrive on site pre- wired, pre-plumbed and factory tested for quick and easy installation—requiring merely a single electric, water and air connection to be up and running. "This compact, batching/mixing plant allows a small precast producer to easily begin making their own professional grade concrete," says ACT's Max Hoene. "And once it's running, look out. The plant allows producers to achieve super-fast batch cycles for efficient, consis- tent, quality concrete production." The CentroMix design suits a variety of plant types, including conventional and archi- tectural precast plus dry cast production. Its portability also suits onsite concrete produc- tion. The CentroMix is available in a range of flexible layout options and expandable as a producer grows. ACT offers the plant in two sizes: ½-yd. or 1-yd. output with high performance planetary CPM Wiggert Mixer, which features large access doors with standard safety locks and premi- um efficient drive for quiet operation. Among other key plant features: • Cumulative aggregate weighing system provides precision batching for up to four aggre- gates; • Aggregate bins can be configured for charging by a front-end loader, or as forklift-trans- ferred exchangeable bins for specialty aggregates; • Optional automatic Hydrotester moisture correction for each aggregate bin; • Precision weigh batcher handles up to three cementitious materials; • Control for up to four admixtures, with factory-mounted mixer inlets available; • Totally enclosed mixer for virtual dust free batching; • Galvanized, perimeter safety guarding; and, • Available skid mount frame to eliminate need for foundation. 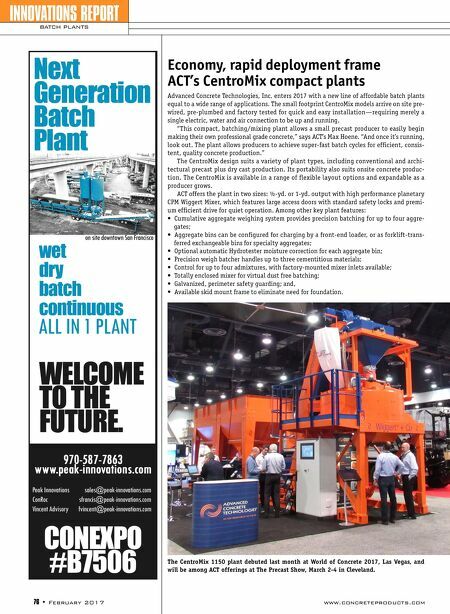 INNOVATIONS REPORT BATCH PLANTS Economy, rapid deployment frame ACT's CentroMix compact plants The CentroMix 1150 plant debuted last month at World of Concrete 2017, Las Vegas, and will be among ACT offerings at The Precast Show, March 2-4 in Cleveland.